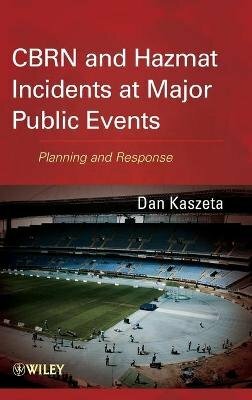 Based on the author's more than two decades of managing core facets of emergency planning and response, this book enables readers to minimize the possibility of a chemical, biological, radiological, or nuclear (CBRN) disaster or a hazardous material (hazmat) incident at public events. Moreover, it sets forth the tools needed to quickly respond to an incident in order to avoid or minimize casualties and damages. With its comprehensive approach, the book equips readers to plan for and manage a multi-disciplinary safety and emergency response team, including police, security, medical, military, and fire and civil protection personnel. Lastly, the author provides fourteen specific public event scenarios, explaining what to do and what not to do for effective emergency planning and response to CBRN and hazmat incidents. These scenarios also set the foundation for preparedness training and exercises. Throughout the book, sidebars summarize the author's extensive operational and managerial experience, helping readers focus on the core tested and proven strategies and techniques needed to prevent or mitigate the impact of a CBRN or hazmat incident. With its unique focus on CBRN and hazmats, this book is essential reading for all personnel charged with protecting lives and property at large public events.